This past weekend we celebrated Diane FIen Kelly’s birthday. She would have been turning 57. So her dear friend Jean Melton lit 57 candles and put them all around her house and threw a big party where we ate, and drank, told stories and jokes, and reconnected with old friends. It was the kind of party that Diane would have liked. I could almost hear her laughing. 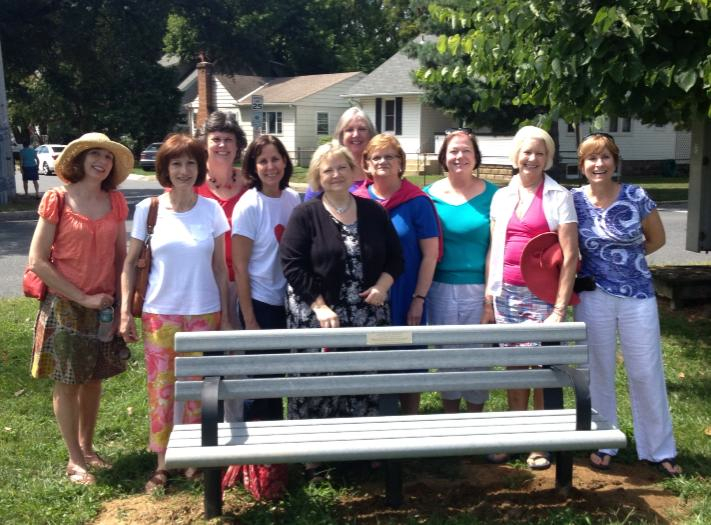 The following day was the dedication of a bench, purchased by our book club in Diane’s honor and memory, positioned on the trail by the USNA stadium trail by her home. 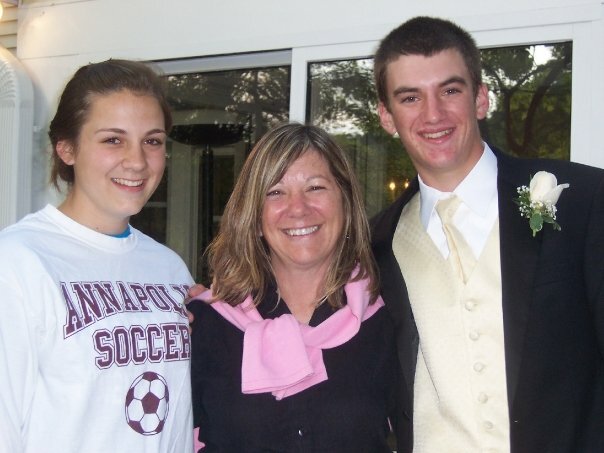 Diane loved to be outside walking on a trail, and her last year on earth she made of point of truly savoring every precious moments, moments that included her two children Brendan and Lauren and her dog Stuart, a rescue from Hurricane Katrina. Book clubs come in all shapes and sizes, and with a variety of procedures and traditions for choosing books, organizing discussions, and providing food and libations. While some years Diane was busy with her work, training teachers in the field of special education teaching deaf and blind children, when present at a book club gathering her enthusiasm for our selection (even if she didn’t read the entire book) and for the food being served was always heartfelt. She was the one who kept asking us to keep a record of the food being served with our selections for a future cookbook. Diane’s big heart and positive approach to just about everything she did was inspiring. She was the kind of person who was always looking out for the “little guy” and the person who when faced with adversity always managed to see the situation in a positive way. Last week we were asked by her college friends for suggestions of the books which were Diane’s favorites and while initially I thought of her puzzling over Kazuo Ishiguro’s A Pale View of Hills , it was Memory Keeper’s Daughter by Kim Edwards which tells the story of the impact of a doctor’s decision to give away his infant daughter at birth because she has Downs Syndrome, that I remember being one of Diane’s favorite books. The doctor in the story assumes his wife will be satisfied raising the daughter’s healthy twin brother and thinking her daughter died at birth, but he’s wrong. Meanwhile his former nurse raises the baby girl as her own in another city and as the years pass memories are not forgotten. That’s all I’m going to say because I certainly do not want to spoil the plot for those who haven’t read the book. So in closing, if you are walking along the trail around the USNA stadium and want to take a moment to stop and think about your day or listen to the birds and feel the breeze rustle through the trees (There are a few small ones nearby) have a seat. 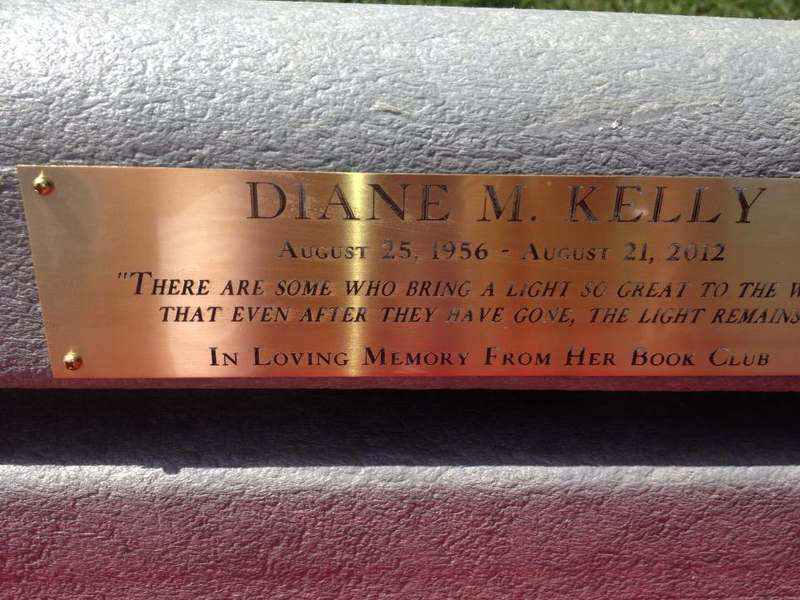 Read the plaque and think of Diane! 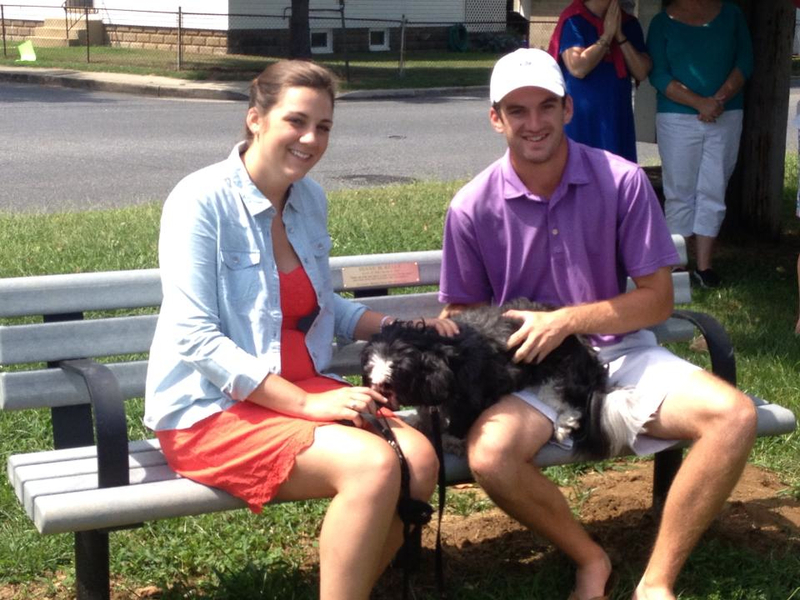 Thank you to Eileen Leahy and the Department of Recreation of Park for helping to organize the bench installation.